Resources are files you can upload into your Device Magic account to reference and utilize during the form building process. Device Magic Databases can now be used as a Resource, which means that previously collected data can be referenced when completing submissions. In addition, all updates or changes made to your Database will be reflected live, so you’ll always have the most up-to-date version on your devices. You’ll no longer need to re-upload the Resource file each time a change is made. Add a new Resource on your Resources page, and select the Device Magic database as the resource type. Then you'll select the form you want to use for your database. The data from the selected form will be available to use when completing future forms. With Device Magic Database Live Resources, you'll always have access to the latest version of your Resources. 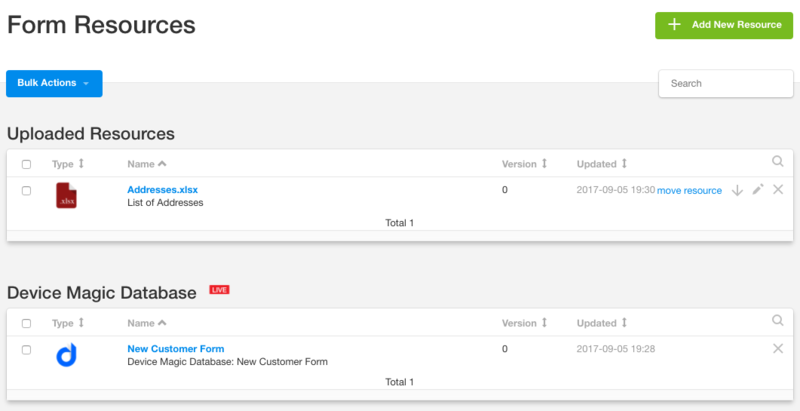 Your forms can be updated based on changes within your live resource(s). Visit our Help Center to read more or find help regarding Live Resources or other Device Magic features.